If PCs attempt to kill their way through this one, they may probably die horribly. There are unique traps and strange allies and finding the target will not necessarily be the end. Surprising, how much Stephen Yeardley managed to cram into this brief module! And yes, the creature choices in the PFRPG-version are as creative as you expect them to be from Mr. Yeardley’s mini-dungeons, which presented some issues for the conversion team of Chris Harris and Kyle Crider. 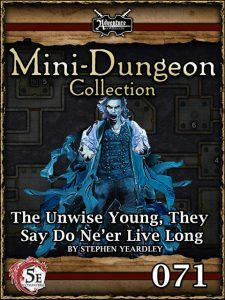 The solution is smart: The mini-dungeon does use a ton of creatures from Kobold Press’ fantastic Tome of Beasts, but unlike in previous mini-dungeons, this one does not include the relevant stats. They simply wouldn’t have fit on the card. In short: You absolutely need Tome of Beasts to make the most out of this, as e.g. the devilbound gnoll prince or the grim jester has not been hyperlinked; sans the book, you should detract 1 or 2 stars from the final verdict. My final verdict will clock in at 5 stars.